Easy kayak access, Close to town and the clear, crisp lakeshore. Opels Lakeside Cabin 2 is a two bedrooms, one bathroom cabin on Lake Superior`s North Shore. Cabin 2 is located on the hillside of Croftville Road just a few miles from Grand Marais. Enjoy views of Lake Superior from the front deck. The Opels Lakeside Cabins share a cobblestone beach that has easy access down a flight of wooden stairs. Enjoy the shared cobblestone beach during your stay. You can enjoy the sunrise from the cobblestone beach. Opels Cabin 2 has a small kitchen area with a dining table. The kitchen is small but ample for preparing meals during your stay. The room also has a flat screen TV so you can enjoy a show while preparing your meals. The bedrooms are separated from the rest of the cabin by curtains. The first guest bedroom has a full bed. The second guest bedroom also has a full bed. The second guest bedroom has a dresser so you can unpack during your stay. Enjoy views of Lake Superior from the windows of the second guest bedroom. The bathroom has a walk-in shower. You will love the covered front porch of Opels Cabin 2. Opels Cabin 2 also has a private fire pit and charcoal BBQ. Enjoy the friendly atmosphere of Croftville Road, a popular tourist destination. Enjoy the crystal clear blue waters of Lake Superior. You will love the beach and community atmosphere of these great cabins. Beautiful sunsets await your visit to Lake Superior`s North Shore. Croftville Road, which is about 50 feet from the lake, intersects the resort. Cabin #1 is built between the road and the lake shore and the other 3 are above the road and are still only an average of 100 feet average from the shore. Great cabin for a great vacation! We had a great time! We enjoyed our stay here at Opel Cabin 2. We had everything we needed, and the location, although in the advertisement it looked like a larger shore area. We would definitely stay here again. Great views of the lake just across the road. The cabin was small but adequate and clean. There was a fire pit with wood ready to burn which was a nice touch! Opel's cabin #2 was everything we expected...clean, cozy and set up with everything necessary for a great weekend on the North Shore. We look forward to our next visit. Opels cabins are quiet and comfy. Love the location and the very quiet neighborhood. We will stay with you again. My friends and I loved the cabin. 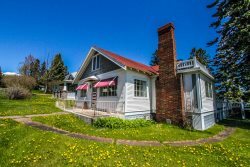 It's proximity to Grand Marais and many attractions made it easy to zip around. It was cozy and small. We were all so happy with how clean it was and that it was well stocked with essential kitchen-ware. The beds were even comfortable. Having the Internet made on the fly research a snap. Didn't touch the tv, but it's there. All around excellent stay. Will absolutely go back.